Google Trends | Random Ramblings..
Google Trends for exit polls!! Came across this nice study on Slashdot. 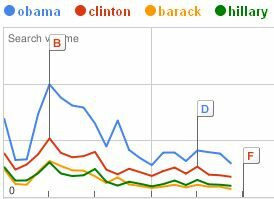 It tries to analyse the correlation between the US presidential caucauses and the Google trends for the candidates during this period. A nice effort at using sometime widely available to draw demographic conclusions.